We have been in Wells, Maine, for the past week. If there is a perfect place on earth, it might be Wells, Maine, in the summer. You sit on the beach, where it is not too hot or not too cold (unless you like swimming, in which case, it might be too cold). You read with the soothing sounds of waves, seabirds, and children's laughter in the background. When you're hungry, you stop by the lobster pound and get awesome seafood. Not just lobsters, but swordfish, scallops, clam chowder, steamers, etc. Coming as I do from the Midwest, I don't eat a lot of seafood, but it's different here. It's what's for dinner, literally, and it's amazing. If you want to be more active, there's kayaking and tons of other boating- or swimming-related activities, not to mention biking and hiking if you prefer dry land. And of course, there's always the simply joy of a morning or evening run on the beach. When it's time to go to sleep, it's nice and cool. If you're lucky enough to be renting a place near the shore, you can fall asleep to the sound of waves. It simply can't be beat. So that's what I've been doing. Polished off the last three books of the Harry Potter series (rereads) in about a week's time. Upped my post-injury distance PR to 6 miles. Went kayaking on the ocean and didn't tip. Tasted swordfish (of Perfect Storm fame) for the first time. Talk about good times! Just before left, we finished the bulk of the painting in our house. 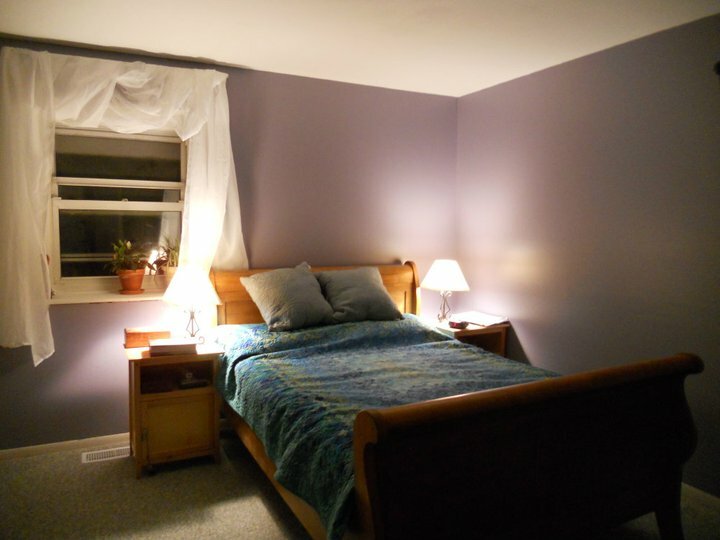 I still have rooms to straighten and pictures to take, but here's what our bedroom looks like with a coat of purple paint on the walls. I was really scrambling for us to finish the painting (at least the bulk of it) before we left for Maine, because I knew that when we got back, the last thing we would feel like doing would be to pick up a paintbrush. And predictably, I am SO FRAKKING GLAD that it's done. We got home late-ish on Sunday night, and were able to just slide into a made-up bed in a clean room with freshly painted walls, which really does wonders. So far this week, I've been able to muster the motivation to do little more than sit on the couch and watch Harry Potter movies to lead up to the release of the final movie on Friday. But last night I pulled in a great harvest from the garden, mostly zucchini. It's amazing to see my efforts finally paying off. I also discovered that I apparently have several volunteer acorn squash plants (!?!?). NO complaints here!